Are you searching for a Konica Minolta Bizhub C364 copier to support your growing business and workload? Well, you have come to the perfect place. Arizona Copiers offers the largest selection of Konica Minolta Bizhub C364 copiers for the best price on the market today. In addition to some stellar discounts, we provide exceptional customer service and speedy delivery for an unparalleled purchase experience. We are dedicated to satisfying each of our customers and offering whatever configuration you may need. Contact us today at 602-428-5885 to receive an incredible quote on your new Konica Minolta Bizhub C364. The Konica Minolta C364 supplies all of the document power your office has been missing and desperately needs to support new business projects or ventures. Although there are a wide variety of copiers on the market, none have all the unique characteristics that are offered by this model. The copier has an astonishing fast copy speed at just 6.9 seconds for color, while black and white only takes 5.3 seconds. The fast printing speed can handle producing 36 pages per minute in color, as well as black and white. This means no more unnecessary time wasted waiting for your documents to be printed. Since the copier utilizes a dual 500 sheet paper cassette tray and a large capacity cassette with a 2,500 sheet capacity, there will not be extra time spent fiddling with the machine to insert more paper often. The machine is ready to go when you are. Furthermore, the copier offers superior color quality, 1200×1200 dpi, flexible scanning abilities, and auto finishing. The high-tech innovations of the Konica Minolta Bizhub C364 will lower your business’ costs dramatically, while also doing your part to protect the environment. With the newest info-palette design, dimensions of your business documents and information can be accessed with a simple swipe of your fingertips. You can even download compatible apps onto your smart phone or other electronic devices to expand your reach and increase your business’ productivity. Contact Arizona Copiers to get started enjoying these tremendous benefits of this copier today. 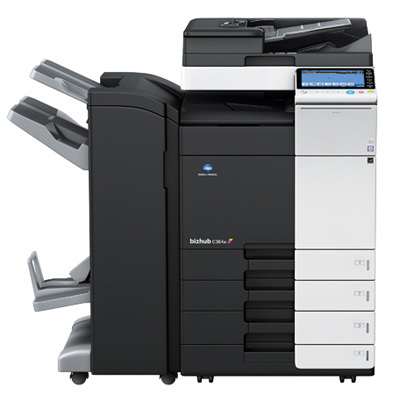 Through all of the products that we offer to our customers, Konica Minolta is one of the top brands that you can trust to deliver a high-quality copier to your business. The company has won numerous awards and recognition for being the number one brand for customer loyalty in the office copier market. The Konica Minolta C364 is a high production professional grade copier that offers multiple unique functions to users. With its tech-savvy features, you will be able to stay ahead of all of your business needs and increase your printing efficiency. If you are considering buying a Konica Minolta Bizhub C364 for your home office or business, please do not hesitate to call us today at 602-428-5885. Arizona Copiers is known for offering the best options to buy, lease, or rent copiers for the lowest price available. We look forward to hearing from you and providing a solution to satisfy all of your copier needs!